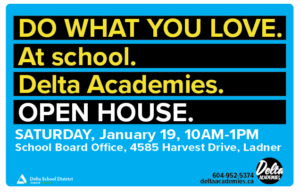 Just a reminder to Grade 7 Parents, the Delta Academies Open House is on January 19th from 10:00am to 1:00pm at The School Board Office (4585 Harvest Drive). Come and learn about the Academies & our new Basketball Academy! For more information, please click on the following link deltaacademies.ca.